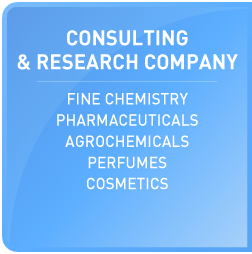 CDP Innovation is a consulting company as well as a research organization targetted to the Fine Chemistry, Pharmaceuticals, Agrochemicals, Perfumes and Cosmetics markets. Its aim is to help industrial organizations in the research, development and industrialization phases. CDP innovation offers to its customers: technological and economical surveys, consulting, chemistry courses on specific domains, sample production and synthetic route set up.